The Professional Regulation Commission announced the official results of the recently concluded Physical Therapists Licensure Examination. The said examination was administered on February 3-4, 2019 in Manila and Cebu. It was conducted by the Professional Regulatory Board of Physical and Occupational Therapy headed by its Chairman, Pollyana G. Escano and members, Raul G. Agustin, Bernadette M. Reyes, Delia R. Pabalan and Rolland Lyle D. Duque. 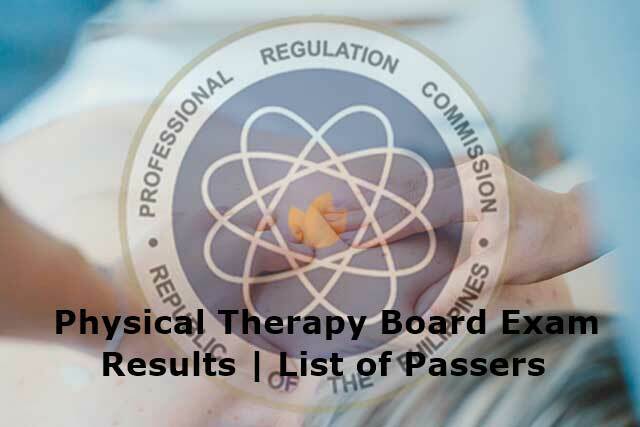 Do you want to know if you passed the February 2019 Physical Therapy board exam? Check your name below and see the results! The Professional Regulation Commission (PRC) announces that 772 out of 1,287 passed the Physical Therapist Licensure Examination given by the Board of Physical and Occupational Therapy in the cities of Manila and Cebu this February 2019. The results were released in two (2) working days from the last day of examinations. Congratulations to our new licensed physical therapists! On February 21 to February 26, 2019, the schedule of online appointment for the issuance of Professional ID and Certificate of Registration will be done online. To accomplish the initial registration, follow our PRC online registration guide to help you through the online application process. On August 2018 Physical Therapy Licensure Exam, 931 out of 1,379 passed the Physical Therapist Licensure Examination. Krisha Marie Gan Badillo from Riverside College topped the board with a rating of 89.05%. She was followed by Rose Anne Blanco Solde and Exequiel Amiel Ramirez both hailed from the Pamantasan ng Lungsod ng Maynila with ratings of 87.10% and 87.0%, respectively. To receive up-to-date information about the February 2019 Physical Therapy Board Exam results, please bookmark this page or Like our official page on Facebook to receive important announcements.